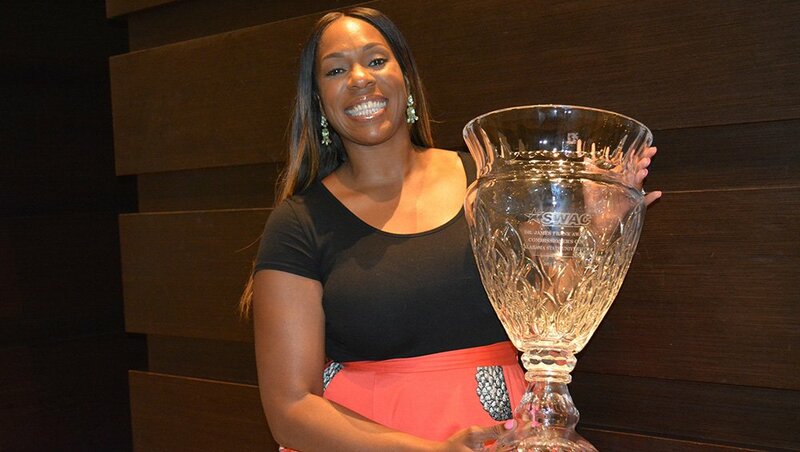 She may have the title “interim” but Williams’ leadership is already winning national accolades. Alabama State Interim Director of Athletics, Jennifer Lynne Williams, was chosen as the 2018 FCS Administrator of the Year by the Women Leaders in College Sports – the nation’s premier women’s athletic leadership association – as announced the Administrator of the Year Award and Nell Jackson Administrator of the Year Award recipients Tuesday afternoon. The recipients will be honored Tuesday, October 16 at the Jostens Administrator of the Year Luncheon at the 2018 Women Leaders National Convention in Atlanta—which will be emceed by Maria Taylor, college sports analyst, and reporter for ESPN. Nominated by their peers and selected by the Women Leaders Awards Committee for their service during 2017-2018, Williams joins a list of seven other award winners that include: Maggie McKinley, Executive Senior Associate Director of Athletics/Senior Woman Administrator, University of Cincinnati (NCAA Division I FBS), Dena Freeman-Patton, Deputy Athletics Director, California State University, Bakersfield (NCAA Division I), Carrie Michaels, Associate Director of Athletics/Senior Woman Administrator, Shippensburg University (NCAA Division II), Stevie Baker-Watson, Associate Vice President for Campus Wellness & Theodore Katula Director of Athletics and Recreational Sports, DePauw University (NCAA Division III), Val Ackerman, Commissioner, Big East Conference (Association/Organization), Jill Jokerst-Harter, Director of Athletics, St. Louis College of Pharmacy (NAIA/NJCAA/CC) and Dr. Amy Wilson, Director of Inclusion, National Collegiate Athletic Association (Nell Jackson award winner). Congrats to the GOAT @J_lynne for being awarded the 2018 Administrator of the Year for NCAA DI FCS by @WomenLeadersCS!!! That’s so awesome and I am so proud to have you as part of my village. Love you & thank you for consistently encouraging me. Williams was elevated to interim director of athletics at Alabama State University (ASU) in October 2017. Previously, she served as the Deputy Athletic Director for the Hornets for the 2016-17 academic year. In her first year as the Interim Director of Athletics, Williams was selected to the Division I Council and also serves on the Football Oversight Committee as part of her council duties. She also served as a panelist at the most recent NACDA Convention in our nation’s capital. Under the guidance of Williams, Alabama State captured their fifth consecutive Southwestern Athletic Conference (SWAC) Commissioner’s Cup by winning eight conference championships. The Hornets’ program also captured five regular-season conference (or divisional) championships, and had three teams finish as conference runner-up and another finish in the top four in postseason tournaments. This past season Alabama State had 37 student-athletes recognized as all-conference, won multiple coach of the year awards and had a Google Cloud Academic All-America selection this season. Alabama State teams played 27 opponents across the board that qualified for the postseason, including eight teams who made the Elite Eight and three others who finished as national runner-up. Not only did Alabama State shine on the field, but they also did in the classroom as well as every team reached the threshold to be eligible for postseason play according to the NCAA APR results. Two of the teams scored a perfect 1000 – women’s cross country and bowling – and three others scored 990 or better. The success continued off the field for the Hornets as several members of the department presented at national conventions, and members of the communications/creative services teams were honored nationally for the work. The Hornet Club – the official fundraising arm of athletics – has seen significant growth and has secured our largest corporate sponsorship of the academic year, and tripling the donations received on ‘Giving Tuesday’ – our designated day of giving (compared to 2016). Meanwhile, the Hornet Sports Network to cover multiple sports in 2017-18, touching a little more than 54,000 listeners/viewers throughout the year. As the Deputy Director of Athletics, she managed the day-to-day operations of Hornet athletics and led the division’s external and community relations initiatives. She currently serves on the Executive Board of the National Association of Athletic Development Directors (NAADD). The Administrator of the Year Award is presented to Women Leaders in College Sports members for significant contributions made as an administrator of intercollegiate athletics. This award, recognizing administrative excellence, is presented annually to members in each NCAA division: Division I, FBS, FCS, Division II, Division III, NAIA/NJCAA or Conference/Organization. The Nell Jackson Administrator of the Year Award is presented annually to an athletics administrator who exemplifies the personal qualities and professional accomplishments of Dr. Nell Jackson. This award is given to an individual who demonstrates qualities such as courage, conviction, and perseverance, and who is an advocate for gender equity and diversity. This award honors athletics administrators who are NCAA/Women Leaders in College Sports Institute for Administrative Advancement graduates, and demonstrate vision and outstanding leadership. Winners will be honored Tuesday, October 16 at the Jostens Administrator of the Year Luncheon at the 2018 Women Leaders National Convention in Atlanta, Georgia. The National Convention is the premier conference for women working in intercollegiate athletics, offering unparalleled leadership and professional development, industry training, and networking opportunities. 2018 SWAC Football: Another Alcorn vs Grambling showdown?